The Peters Township Education Foundation is an independent, non-profit organization whose mission is to develop funding sources for the District and encourage and enable personal involvement of alumni and friends in support of the staff and students in Peters Township. The goal of the Foundation is to help the students of Peters Township to become independent, caring, contributing members of society by supporting programs critical to a child’s successful educational development. The Foundation proactively works to enhance education by directing resources to programs that enrich opportunities offered by the School District. The Peters Township Education Foundation is proud to announce the winners of the 2019 GEO (Granting Educators Opportunities) Grants. 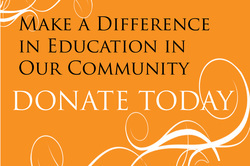 This year, the PTEF will provide $10,794.18 in funds to support classroom projects. Click here for a complete list of winners and a look at our check presentations! The Peters Township Education Foundation is proud to announce the addition of two new Board members. During the October meeting, the Board welcomed PTHS students Uma Thachapuzha and Hannah Stuck. The students will serve a one-year term.